I've written a number of posts about play and argued that it is important for many reasons. Broadly, it stimulates children's creativity while assisting their development cognitively, emotionally and socially. It also encourages their imagination, fine and gross motor skills, decision-making, problem solving and risk taking. As well, it helps children to learn about themselves through success and failure and to build relationships with parents, their siblings and friends. However, in this post I want to make just one key point - that simple play is best. Simple opportunities for play will always (well, almost always) capture their attention, that's why the box so often wins out over the expensive and complex toy. play that involves other people, both actively and passively (this is especially true of parents). It is important as parents and caregivers to be on the lookout for opportunities to structure situations during the day that permit and encourage stimulating play. 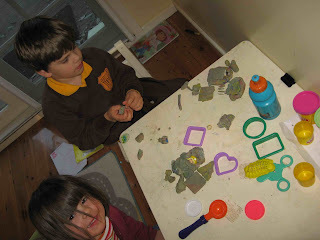 While its hard to do fancy stuff when faced by the demands of 2-3 children (or even more in the case of some readers of this blog), if children are engaged in stimulating activities they are less likely to be driving you nuts. And the simple stuff is the easy stuff. One final thing, as I indicated in a previous post it's also important to allow your children to take lots of initiative - play is when they can take the lead and show you how to do things. To illustrate what I mean by simple play, here are three examples of play situations that I shared in the last two weeks with my grandchildren. I called at my eldest daughter (Nicole's) a week or so ago and quickly began talking and playing with my three grandchildren (Jake 5, Rebecca 3 and Elsie 18 months). Rebecca got out some play dough, Jacob joined her. I sat down and we began rolling, patting, cutting and shaping. 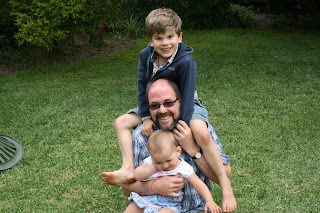 Elise (18 months) joined in more to be part of it than out of interest. Rebecca was making shapes when Jacob decided to make a bed for his platypus. 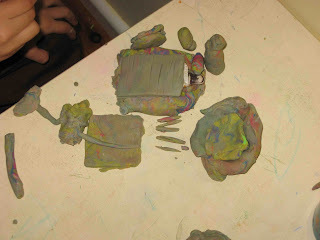 Jacob was wrapping a small plastic platypus in the playdough. I asked "Is that a bed?" He decided that it was. I said to him, "Why don't you make a blanket for him?". Within minutes he'd made a lamp, some worms (for him to eat), a mat, table, books etc. Rebecca was watching and I suggested that she put one of her small dolls to bed. She proceeded to mirror Jacob's creative constructions and add variations of her own including a pillow, cat and vacuum cleaner. Elsie, joined in asking me to roll some dough, pulling it apart, cutting out shapes, trying to get some attention and generally trying to be part of what everyone else was doing. 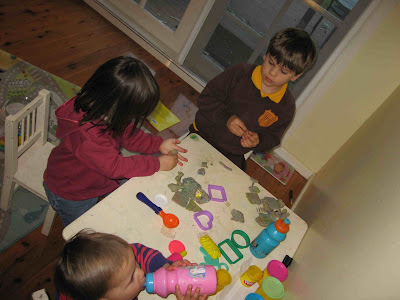 We spent at least 45 minutes playing in this way as they looked at each other's creations, we told stories about the doll and the platypus, they asked and answered each other's questions, took turns, encouraged joint activity, negotiated the use of the materials and so on. 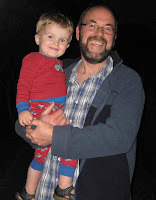 Today I was playing with my daughter Louise's son Samuel (age 2.5 years). We started playing with cars, just pushing them around, making noises etc. We moved on to his trains, made a track, a tunnel out of a box, and then basically pushed our trains around and around, swapping trucks and engines, taking turns being in front and behind, taking turns on the sidings etc. While we were doing it Sam's dad (Jon) was nearby pulling a box apart, undoing some screws and putting them into a bag. Sam decided he'd join in and I joined them both. His Dad left to do something else and left us with the half dismantled box, the screwdriver and the partially filled bag of screws. Sam picked up the screwdriver to try to remove a screw, I helped him, then showed him how to screw one in. He then noticed that the screwdriver was magnetized and could pick up the screws. I suggested he pick some up then pass them to me to put into the bag. We filled the bag, and as we did so we marvelled at the way sometimes the screwdriver picked up 3 or 4 screws. We counted them, laughed when we dropped them, filled the bag, and then emptied it again. This went on for about 20 minutes. Sam suggested I have a turn and he would put the screws in the bag. Eventually, he lost interest and we moved back to the trains. 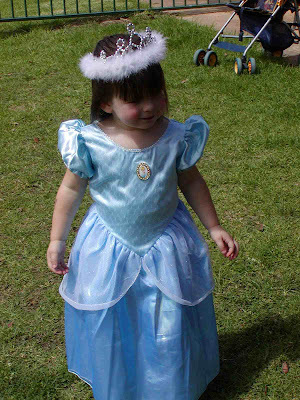 Carmen and I called at our daughter Nicole and son-in-law David's house on Saturday and we ended up in the back yard. Carmen was cutting the kids' hairs (it was Jacob’s turn), Nicole and David were preparing afternoon tea. . The girls took the opportunity to rough me up a little. Rebecca said, “Sit down here Grandad" (meaning the verandah on their cubby). When I did she jumped on my back. I immediately responded by clasping her legs and standing up. “Oh no, I screamed, what’s on my back?”. “I’m the Hagy". "Oh no," I said, "I'll toss you in to the ocean, because Hagy's hate water." I raced off to the other end of the yard with Rebecca squealing with delight as I ran too close to the bushes and tossed (well lowered) her into the sandpit (ocean). This was repeated several times before Elsie claimed her turn. This continued for about 15 minutes with many variations (different monsters and different responses from grandad to the dastardly creatures). Eventually Jake sprung from the hair-cutting chair and claimed his turn. This silly play involved creative story (in which all of us participated two at a time), word play, sound exploration, physical activity, turn taking etc. provided opportunities for fun, creativity, and learning. As a parent it is always difficult to know just how to support your children as they develop physically, emotionally, spiritually and intellectually. 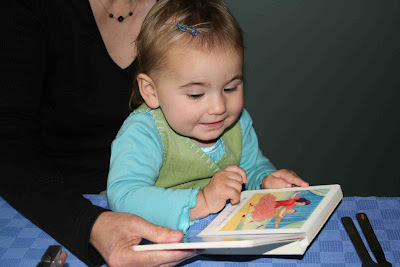 One of the readers of this blog (Louisa) has asked about the program “Your Baby Can Read!”. Is it a good idea? So I decided to review it for readers of this blog. The program was developed by Dr Robert Titzer. His website suggests that he is a “recognized expert, infant researcher…professor and teacher…(who has) extensively researched infant learning and development…. (with) a Ph.D. in Human Performance at Indiana University, where he developed this revolutionary early learning approach with his own infant children. His research on reading during infant and toddler years captured the interest of educators, researchers, parents, government agencies, and the media worldwide. Dr. Titzer’s research has been published in scientific journals, including the prestigious Psychological Review.” Most people would probably have become aware of this program through TV current affairs programs. The “Your Baby Can Read!” program includes 5 DVDs, 5 word and picture cards, and 1 wipe-clean word card and pen. The Starter DVD introduces your child to 22 words. You play the DVD twice a day (which takes about an hour in total) for a month and then use Volume 1 for two months. Volume 1 reviews the starter video and introduces 30 new words. After that, parents are encouraged to move on to Volume 2 that introduces 50 new words for two months. Revision of the Starter and Volume 1 DVDs is encouraged. Volume 3 follows and introduces 50 new words and more songs and poems. You are advised to use this almost exclusively for another month and then switch to Volume 4, which reviews the other DVDs. You then alternate this video with the other videos. 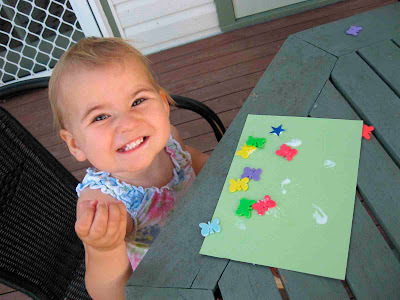 The basic approach is straightforward, it is primarily a program that teaches children to recognise words by ‘sight’. This means that the child uses visual clues such as the shape of the word, and some aspects of letter configuration (e.g. an initial letter, an unusual ending) to identify the word instantly.This is a program that trains children to recognise words instantly. The program does not teach children to ‘read’ in the fullest sense of the word, rather it teaches them to recognise instantly a number of words. This approach (which does have its place in beginning reading education) stresses that the mind prefers holistic approaches (this has been contested of course by many researchers). It utilises the brain’s capacity for the Gestalt effect - the ability to retain an holistic image of a figure, a word, an object, a number etc, rather than just a collection of lines, elements or separate objects. As I outline on my website, (here) to be an effective reader any child ultimately needs to: learn the sounds of language and their correspondence with print; understand the structure of language and how it works; learn how to use language appropriately for specific purposes; and learn ultimately how to critique written text. While the program claims to teach children incidentally about sound-symbol relationships there is little evidence to support this. In introducing a program like “Your baby can read!” you are essentially devoting time to structured repetitive learning of a limited type that would probably replace other forms of learning. I'd encourage any parent who is considering using this program to ask themselves two simple questions: What other things would I stop doing while I use this program? What would be the impact of the loss of this other activity? Would I introduce my children to this program? No. This program does not teach children to ‘read’. Neither is it clear what its benefits are, nor if in fact it could have a negative effect on your child and impede their long-term learning. While the program’s creator claims research expertise in early literacy, I was unable to find much evidence to support this claim, and virtually no citations of his limited publications by other researchers. Instead of using this program I would encourage my children from birth by stimulating their language (singing to them, reading with them, asking questions etc) and learning (exploration, invention, creative play etc). In short, I would be constantly engaging with my child in varied ways. 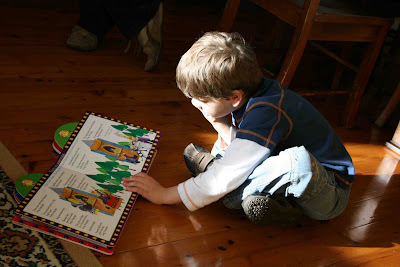 See related previous posts on “Teaching moments in everyday life” (here), “Play” (here) and “Basic literacy support: Reading with your children” (here). I also provide an outline of an integrated approach to early literacy on my website that might be of some use. Here is the second instalment. a) Planned craft could include - simple beadwork, noodle craft, mask making, making plaster moulds (and painting them), anything for young children that requires paper tearing, gluing, glitter, stickers. b) Simple activity books that you might buy - discount shops like Reject Shops, Teks, Go-Lo etc often have stacks of colouring in books, dot-to-dot, alphabet, pre-reading etc. Not really all craft, but they combine some colouring with word play etc (don't do too much of this). c) Unstructured creative craft needs materials - stock up when you go to the supermarket with simple materials like paper plates (good for masks), brown paper bags, sticky tape, glue, cotton balls, tooth picks, paper cupcake holders, straws (cutting up and threading), noodles (for threading). d) Reverse Garbage - The Reverse Garbage is a not-for-profit co-operative that sells industrial discards, off-cuts and over-runs to the public for creative uses. They have been operating in Marrickville for 31 years (this one is for Sydney people only, but there may be equivalents in other places). Take the kids as an excursion, let them choose some stuff then take it home to use. a) Dress-up box - if you haven't got one take the kids to the Op shop to start one. You might even pick up some gems like old helmets, hats, belts (you can cut them down), handbags etc. b) Water play - this is hard in winter, but maybe you could make bath-time special for littlies with extra bubbles, different stuff to take in it. In warmer weather give them a bucket of water and some things to scoop, sieve etc - BUT ONLY UNDER SUPERVISION, kids can drown in a few inches of water, even in a bucket. c) Play dough - Carmen's can't fail recipe: 1 tablespoon of oil, 1 cup of plain flour, 0.5 cup of cooking salt, 2 tablespoons Cream of Tartar, 1 cup of water, colouring. Mix together and put in a saucepan on medium heat until it binds together, stirring all the time. Fold together by hand. If you keep it in a sealed plastic bag it will last for ages in or outside the fridge. d) Bubbles - can't go wrong with bubbles. e) Balloons - blow them up, let them go, kick them around, let out the air to make noises (boys love it! ), try some helion ones and let them go, etc. f) Build a cubby house - no not with wood, just use a table, some chairs, wardrobes (hitch the blankets into the top of the doors, some pegs and sheets and blankets. By draping them over other objects you should be able to create a special space (about 2x2 metres is enough for three small kids). Try to get at least 1.5 metres of height. Have the kids 'help' and then get them to collect some special things to have in the cubby. Use a toy box for a table, some cushions to sit on. I always let my grandchildren have my cheap transistor radio from my shed (lots of fun). Girls might like a tea set; boys will collect animals and toys, both will like books. If you're up to it, climb in as well and read some stories. They'll like the edges tucked in to cut out light so you might need a torch. I've seen a cubby of this kind amuse kids for half a day. Then of course for the adventurous you can share some snack food as well. a) Treasure hunts - write the clues on paper using words and pictures depending on ages and make the treasure worthwhile (chocolate, a coupon for an ice cream in the kitchen etc). d) Cooking - kids love cooking with their mothers or fathers. Do simple stuff; Nicole has talked about this a number of times at 168 Hours. 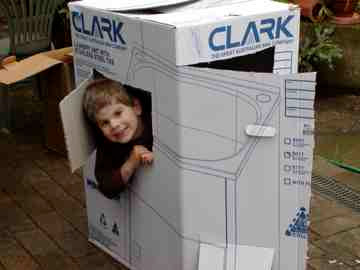 e) Household chores - I know that Nicole has blogged on this; Jake and Rebecca just loved washing the outside windows. Give them a bucket, sponges, scraper etc and they'll have fun. They'll enjoy gardening as well (give them a confined and simple task) if you do it with them. f) Scavenger hunts - endless ideas for this, great in the park or in a yard. For a great variation try an insect scavenger hunt. You'll be surprised just how many you can find. You'll to be careful turning rocks over and digging around, but even in Australia it's low risk if you supervise. Place a pile of bricks in a damp place and then let the kids help you to uncover them a few days later - watch the critters scurry. It's the school holidays in Sydney (in fact in most of Australia) and so there are lot's of parents and caregivers trying to stimulate their children, in order to keep them busy and out of mischief. At the suggestion of my daughter (Nicole) I've written a post with some ideas for parents. This has become bigger than I had anticipated (and could have gone on forever). So I've decided to do it in two posts. One today and one tomorrow. Have a strategy for the holidays - try to plan a few significant events and think through the general structure of each day. Expect bad weather - think about some ideas that will work in rainy weather as well. It's called the "Law of Holidays"; expect lots of wet weather and a day or two of sick kids. Visit the library together (check if your local library runs any special holiday events for children) - choose books together, read some there, let each child borrow one toy and a DVD. Take home a supply of fresh books (fiction and non-fiction, maybe even branch out into poetry if you're not already there). Visit an Op shop together and let each child choose a few books to keep (you'll be able to afford the prices). See my post on book exchanges, op shops and web exchange sites here. After reading Rod Clement's hillarious book "Counting on Frank" get your children to create an experiment in response - how many jelly beans in the bottle type guessing game, how many rocks does it take to overflow the birdbath (or the bucket). After reading Shigeo Watanabe's book "I can build a house" get the kids to build a house from boxes (cut the windows, doors, paint it etc). Again just cardboard boxes are needed. After reading Graeme Base's "The Waterhole" get them to paint the waterhole (they cam draw the aimals, cut them out and paste them around the waterhole). 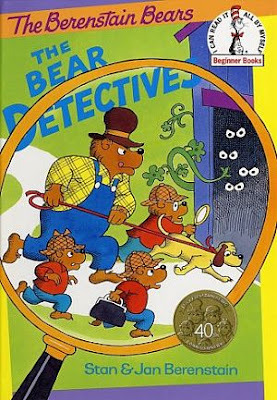 After reading Stan & Jan Berenstain's book "The Bear Detectives" give your children a note pad each and send them into the back yard to solve a mystery (e.g. What happened to the second pink sock? Who dropped that mess on the lawn? Which bird is making that noise? As a variation from reading why not try a read aloud book (book with a DVD or tape) - great in the car but good for variation at home. You might also consider looking for DVDs or videos of the books. Op shops are great places to pick up old videos for about $1 each. We've picked up some wonderful videos that bring new and different life to the books (some are hopeless of course, but others are excellent). WARNING, WARNING! Our family can still recite "Green Eggs and Ham" 25 years after a trip across America with a taped copy of the Dr Seuss classic which became my youngest daughter Louise's favourite at the time. I've already mentioned dramatisation above but it is an excellent way to respond to a book. If you have a dress-up box all the better. Let your children either re-tell the story through dramatisation or improvise. Get involved to help set the pattern for turn taking etc. I play a mean wolf, and an even better Grandma! 2. Writing - Writing is greatly under-utilised. Encourage all chidren (even as young as 1 year-old) to 'write'. Give them some paper and ask them to write. Write with them. Make up some lined books with a cover and suggest that that they tell a story in words and pictures. Even 3-4 year-olds will give the words a go. Introduce older children to diaries or holiday journals. Tech savvy mums and dads might even set up a family blog that can be read by friends and relatives (even if only for two weeks). Start a joke book - give them some jokes as models ("Knock, knock", "Why did the centipede cross the road"....). Try a riddle or poetry book. Write letters and send postcards to relatives and friends. 3. Language experience - read my previous post on LEA here. It is essentially draws on children’s firsthand experiences that become a focus for discussion and exploration and eventually is recorded as a written text in some way. The experiences can be as simple as a trip to the local creek, an insect hunt in the yard, an excursion somewhere (e.g. a fish market, ferry wharf, airport etc). If you're in the city the zoo takes a lot of beating. It's expensive one-off, but a Zoo Friends' program (e.g. Taronga Park Zoo, Sydney) will enable you to go whenever you like for about the cost of 3 family trips. If you live in Sydney a cheaper option (but a good one) is Featherdale Wildlife Park at Blacktown, where you'll pay $57.50 for a family pass (2 adults and up to 4 children) and the kids will get VERY close to the animals (and will be able to feed them) in a small and friendly park with lots of free parking. 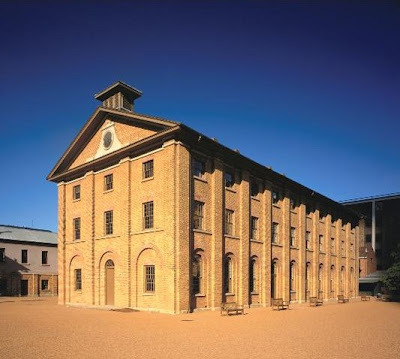 A good museum - in Sydney we have many including the Australian Museum in College Street, the Power House and the Museum of Sydney. The Australian Museum has a wonderful dinosaur exhibition on right now (it is incredible!). An historic site (there are some free ones and some that charge) - e.g. La Perouse including Captain Cook's landing place is free, Elizabeth Farm, Old Government House (Parramattta), the Hyde Park Barracks (one of my favourites) will cost something to enter. Again in Sydney there is the Aquarium and the Maritime Museum. The movies - Tuesday is usually half price at many theatres. If you're not in Sydney this is no excuse, most towns of 10,000+ people have significnat places to visit. 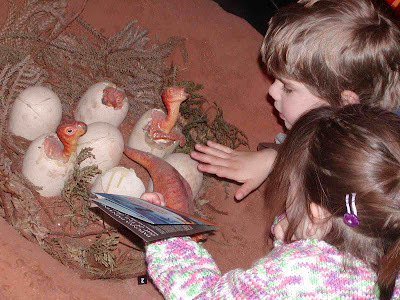 For example, the Australian Mineral and Fossil Museum in Bathurst (NSW) is a stunning museum that will get any child interested in rocks!. Sovereign Hill is a replica of an early Australian gold rush town and its in regional Ballarat (Vic). You'll find Timber Town, that re-creates an early Australian mill town in the 1800s, at Wauchope (near Port Macquarie) on the NSW mid-north coastal region. A beach - John Wells has documented all 150 of Sydney's beaches complete with public transport advice and things to do - this is a classic non-commercial website. You can have fun even in winter. Rug up and collect shells, rocks and just fossick. Visit a different park/playground with lots of equipment or open space. Every town or city has a good one. Big cities like Sydney have lots (e.g. Bicentennial Park; Centennial Park; Mount Annan, Paramatta Park, The Spit and many community playgrounds) There are websites that offer information on some major parks (for a great site with things to look for, photos etc check this out here). An observatory (e.g. Sydney Observatory has a full holiday program including a 3D space marathon) - many universities have observatories that are often open during holidays or for major astronomical events (e.g. University of Western Sydney at Werrington). It's even better if they have a planetarium as many observatories do. A trip on public transport to an interesting place, e.g. train trip to Katoomba, Central Coast, ferry trip to Manly - the Zig Zag railway at Lithgow and the Thirlmere Railway Museum are worth a trip (the latter is stunning and is a must see for any Thomas the Tank Engine fan). Both are about 90 minutes drive away but can also be reached by train (sometimes there are special steam trips). Visit a pet shop at the local shopping centre (take the time to enjoy it). The above ideas are not meant to be comprehensive; just a start. When I was a child my Dad would occasionally take me to the Book Exchange so he could choose a few books. But to be honest, I would usually go to the pet shop next door. It didn't occur to my Dad to choose some books for me. Occasionally, I'd sneak in for some comics, but the opportunity for me to get some children's books was a lost opportunity. The exchanges still exist in isolated places and typically allow registered customers to swap a book for a different second-hand book, or purchase one at a very low price if you are not a registered user. One might wonder why people would use a commercial book exchange when public libraries are available (more on these below), but the key difference is that the book exchange allows you to own the book and keep it for longer periods of time. There are many good reasons for book exchanges of all types (noting that universities, hospitals, guest houses etc also use them). The most obvious is reduced cost. But there is a second good reason; they are environmentally friendly. In a recent article in the Guardian, Charlotte Northedge points to the advantages of borrowing rather than buying. In the past two years, a number of online book-swapping sites have commenced. One example is BookMooch.com, which is a site run from California where people enter the titles of the books they want to give away on a website, and earn credit that enables them to borrow each time they swap a book. Northedge points out that what sets sites like BookMooch apart from some others is its international scale. It has 68,930 users in 91 countries. "Since its launch in 2006, nearly 700,000 books have been swapped; The Memory Keeper's Daughter, the most exchanged - or "mooched" - book, has been swapped 755 times." Another example is ReadItSwapIt.co.uk. The swap process seems simple; you find a book you like, ask to swap with another ReadItSwap member. Unlike traditional book exchanges, the search for and choice of books occurs over the Internet. The number of books you can request from other users depends on the amount of positive feedback you have from other users. I'll leave it to others to calculate the carbon produced by a web-based swapping system (I'm assuming that mailing stuff across the world has an environmental cost, as does the power that runs our computers), but there seem to be significant benefits in swapping programs of all types. Another variation on the recycling of books is the humble opportunity shop. We regularly pick over the shelves for good children's books. While they are often filled with some very average titles, you regularly pick up gems for anything from 20 to 30 cents. This is particularly useful when you're on holidays. When we are away with our grandchildren on holidays we still make an early visit to the local op shop and always return with a bundle of books that provide ongoing pleasure and stimulation well beyond any holiday. Now Carmen has a real gift for finding the great book amongst the not so great books. If you live in Sydney or Melbourne you can even buy a book that offers a comprehensive guide to where op shops are, public transport connections etc - "The Treasure Hunter's Guide". Developed countries like Australia and the USA are blessed with wonderful public libraries that usually do more than just offer books. They often run programs for children, and also loan toys, CDs and DVDs. When my children were just toddlers we got them their first borrowing cards. One of my greatest joys was to take my two daughters to the library most Saturday mornings and to bring back piles of books. A hint - always try to make it an easy number to remember so that you can hunt them down when it's time to return them. I'd also suggest that you make (or buy) library bags for them and suggest that they keep them together. I've blogged previously on the importance of public libraries. In that post I commented on the point made by an American colleague Dr Allen Berger that libraries are also a great 'green' resource. One of the qualities of a great children's book is usually that it develops a number of significant themes as it tells its story simply and well. The secret of such works is that the development of the theme does not draw attention to itself, nor divert attention from the narrative and its characters. The themes that children's books explore are almost endless but some common ones include: the challenges of growing up; the search for identity; love; human loyalty; death; environmental concern; the wrongs of war; courage; coping with difficulties; overcoming fears; friendship and so on. I find that I regularly recall good books (both adult and children's fiction) when confronted with issues each day. 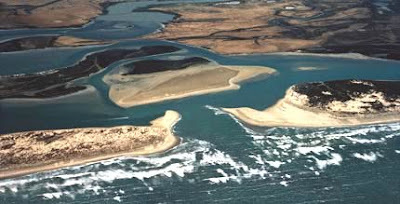 For example, I was reminded of a children's book just last week when reading a newspaper article about the impending environmental disaster facing the Murray River basin, including its stunning delta region known as the Coorong. How sad it is, that the once great Murray River (Australia's Mississippi) is on the brink of destruction and with it the great Coorong as well. In an article published in the Sydney Morning Herald (21.6.08) Martin Falanagan ("Cry me a river") speaks of the plight of the Murray River and the Coorong. The article reports that the 'freshwater' Coorong, once home to hundreds of thousands of birds, is now in places six times saltier than the sea. "Storm Boy lived between the Coorong and the sea. His home was the long, long snout of sandhill and scrub that curves away south-eastwards from the Murray Mouth. A wild strip it is, windswept and tussocky, with the flat shallow water of the South Australian Coorong on one side and the endless slam of the Southern Ocean on the other. They call it the ninety mile beach." ".....the whole stretch of the Coorong and the land around it had been turned into a sanctuary.....And so the water and the shores rippled and flapped with wings. In the early morning the tall birds stood up and clapped and cheered the rising sun. Everywhere there was the sound of bathing - a happy splashing and sousing and swishing. It sounded as if the water had been turned into a bathroom five miles long, with thousands of busy fellows gargling and gurgling and blowing bubbles together. Some were above the water, some were on it, and some were under it; a few were half on it and half under. Some were just diving into it and some just climbing out of it. Some who wanted to fly were starting to take off, running across the water with big flat feet, flapping their wings furiously and pedalling with all their might. Some were coming in to land, with their wings braking hard and their big webbed feet splayed out ready to ski over water as soon as they landed. Everywhere there were criss-crossing wakes of ripples and waves and splashes. Storm Boy felt the excitement and wonder of it........."
Colin Thiele (1920-2006) was one of Australia's greatest children's authors. He was born in Eudunda in South Australia. He was educated at several country schools including Kapunda High School before studying at the University of Adelaide, graduating in 1941. He served during WWII in the Royal Australian Air Force and attained the rank of corporal. After the war he taught in high schools and teacher training colleges. He wrote more than 100 books, which often described life in rural Australia, particularly the Coorong region of coastal South Australia. His stories have wonderful humour, adventure and a very strong sense of place. Several of his books have been made into films or television series, including Sun on the Stubble, The Fire in the Stone, Blue Fin, The Valley Between (CBC Book of the Year in 1982) and Storm Boy. While he wrote mainly for primary aged chidlren one of my favourite Thiele books is a picture book, Farmer Shultz's Ducks (1986) set in beautiful Hahndorf (SA). It was shortlisted for the CBC picture book award in 1987. In 1977 he was made a Companion of the Order of Australia (the highest civil honour in Australia) for his services to literature and education. He suffered from arthritis from the 1955 and eventually moved to the warmer climate of Dayboro in Queensland where he died in 2006.